Custom wide body 2011 Dodge Charger R/T - "The Reaper"! Custom wide body 2011 Dodge Charger R/T – “The Reaper”! Custom wide body 2011 Dodge Charger R/T – “The Reaper”! 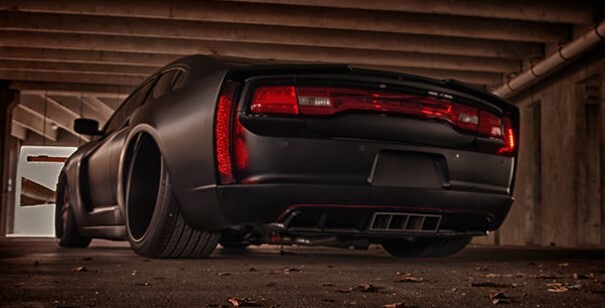 The Reaper is a one-off 2011 R/T Charger with a radical wide body treatment. It took about a year to complete. Heated and cooled front seats, heated rear seats, 8.4″ U-Connect system, heated steering wheel, adaptive cruise control, sunroof, backup camera, etc. And if that’s not impressive enough, this kit also packs RideTech Shockwave front struts, shock absorbers, 4 corner sensors and a 5 gallon tank. As for the wheels, it’s only the best: Forgiato Vizzo 24×9 3 tone front wheels, Forgiato Vizzo 24×15 3 tone rear wheels and Pirelli tires. The audio inside this crazy custom wide body 2011 Dodge Charger R/T is as if you were in a discotheque or something, Rockford subwoofers, amps, component speakers. The interior is black, mostly custom made of black leather and suede with red stitch. I can go on and on about this car for days, but it’s best that you check it out! New Ford Police Interceptor ballistic testing! This scooter rider does one of the most dangerous stunts we’ve ever seen! Chuck Mallett’s retro styled 2014 Chevy Silverado, a real piece of work! Daredevil old lady steals a BMW M3 and does epic donuts and drifts! What Is a Drill Bit And How Drill Bits Are Made? !